This introduction considers the origins of the book and provides a critical overview of the absence and marginalisation of female desistance narratives internationally and particularly within the context of England and Wales. The chapter goes on to critically consider the contested definitions for desistance and the historical development of studies concerned with ending offending. The gender blindness of desistance research thus far, reflecting women’s subjugation within both the justice system, and criminological research more widely, is examined. The chapter provides an overview of the contextual location of the current project, offering insight into both the wider Northshire area and the Women’s Centres (WCs) and Housing for Northshire (HfN) Project, where the original research for the book was situated. 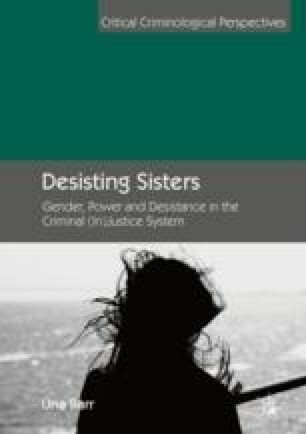 An overview of the desistance contexts of the women’s lives, particularly focusing on the lives of the criminalised women interviewed for this research, is briefly given here. Participant profiles are briefly included to highlight the plurality of experiences of the Northshire women, yet also the common experiences of economic and social marginalisation, which provide the backdrop to their law-breaking and desistance. Finally, the chapter outlines the structure of the book.